I became a five-a-side goalkeeper for the usual reason – sloth. Five minutes into any game, wheezing, glossy, highlighter-pink, I would sub myself into goal to grab a breather. Some other slob would soon come in and replace me, but five desperate minutes later, having chased the ball around dutifully like an aging Labrador, I would limp back into the safety of the goal area. With the back of a downcast head heaving gasped wordless lungfuls at my replacement, I would, more instructively, indicate with a finger the universal signage for I-am-dying-please-allow-me-this-one-favour. Over the years, however, something transpired. I will be 40 in 2013 and perhaps in sport-years an old dog. But learnt I have. I played football, or soccer as we ignorantly called it, for the first 17 years of life, representing my New Zealand province up to under-18 level. The fact that barely 11 under-18s played football in North Otago helped enormously. I was also the only left-footed player so a shoo-in for the larboard wing. But as the full blast of adolescence raged through my bloodstream, all nonconformist radical (with football inappropriate haircut), I packed it in. Another 17 years passed, and the chance arose to play ‘indoor soccer’ at work. Brilliant I thought. I will be great again. I will hot-knife through these rugby-addled fools like butter. Running onto the pitch, the ball rolled in my direction. Here was my moment. I visualized the sinuous run upfield, drifting, jinking, feigning. Moving to trap the ball, I instead stood on the front of it and face-planted into the Astroturf. My 17-year-old body had deserted me. I looked down in dismay: When had I become so bell-shaped, so ambling? But I kept at it, and, moving to Britain, played more and more. My stints in goal grew longer. Yet I still saw these as time-outs, a less boring subs’ bench. In my head I was a winger, a glory-hound glory-bound. Besides, others were better than me in goal … not that I was that bad. One team in an annual company-wide tournament last year needed a goalie. I had been playing a bit more goal for my five-a-side league team, Red Star White City, who were at the time bottom of the bottom division in the BBC league. So I volunteered. The tournament was catalytic to a realisation. We won our group, and I was getting a lot of praise for my keepering. We won our quarter final. (Push play on ‘Eye of the Tiger’.) We brick-bottled it in the semi and exited. But throughout I was diving, rushing, making myself big, cutting down the angles, sticking a leg out. We were drawing a crowd, and I was the instigator of a pleasing percentage of the oohs and applause. Perhaps – I blinked, shuddering – I was actually better in goal. Pushing into the Brad Friedel years I have accepted my role. The occasional run-out is always appreciated, but first and foremost, I’m the goalie. Red Star White City ascended into the second tier of our league the season before last, and then narrowly avoided relegation back down. This season (a ten-week period) we’re sitting mid-table. It’s hard to believe. We are not particularly hot, skill-wise, and our league is packed with scarily good players. One or two of us have some tricks and pace, but if we keep possession for more than four phases it’s a miracle. Where we excel is organisation. We are in fact like the undefeated New Zealand team in the 2010 World Cup. A bunch of Ryan Nelsons everyone expects to walk over, but who somehow hang in there through sheer will and constant harrying. Defence, we do well. And the heart of the defence is the lunk with the gloves on. Last night we won 3-0 against our arch-enemies Refine United. And in doing so I reached the highest height of my goalkeeping career so far. A bunch of saves all around the area, including three (not entirely over-egged) diving fingertip numbers and a classic backwards-stuck-out-leg-having-gone-the-wrong-way-initially, giving us the clean sheet. In the morning report, I received not only man of the match, but player of the week in all fixtures, and the goalie spot in the (fabled pantheon of) team of the week. I am literally choking in goalie glory. Next week of course I will let in a stupid one at the near post or fumble a back-pass into my own net, but before a fall comes some rather lovely pride. 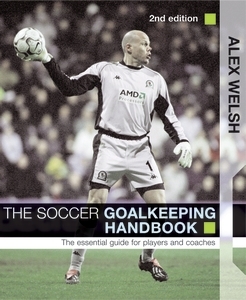 I still resent my inability to nip, dart or achieve anything approximating fitness, but like Brad on the cover of The Soccer Goalkeeping Handbook, by legendary keeper-coach Alex Welsh, I am aging not ungracefully. Constantly adjust your position as the ball moves so that you are always in the right place as the opponent shoots; and always be ready. Adopt a low, ready position and become a good exponent of the collapsing and low-diving saves. If not making a clean catch, parry or deflect into safety zones (wide of the goal). Develop good blocking techniques for close-range shots. Counter-attacking to advantage. If counter-attacking, throw to the back foot (the one closest to the opponent’s goal) and if seeking to retain possession throw to the safe side. Remember a pass is a present so don’t give the receiver a control problem. This entry was posted in Football, Goalkeeping, Team Sport and tagged Alex Welsh, Brad Friedel, five-a-side, Football, goalkeeping, New Zealand, Nick Ascroft, Red Star White City, Ryan Nelson, soccer. Bookmark the permalink. Tremendous, Nick. I can vouch for your performance in said company-wide competition. Having assumed your mantle I now also view myself as primarily a goalkeeper when tournament time comes around, although my gloves are now in a shocking state. I think it’s a technique problem.